I’ve got LOTS of Christmas decorations, but can you believe that I didn’t own a single nutcracker before this DIY? Well, good news is that now I’ve got 6 of these guys and I absolutely love my new set. This DIY is probably the easiest one I've ever done, and you know, sometimes those turn out to be the best ones! You don't have to think too much about them and they still have a wow factor in the end. The colors are all it took to turn these nutcrackers from drab to fab and I have to say I love their new look. If you're looking to edge away from the traditional red and green décor this holiday season, I think this DIY is perfect for you! The directions for these nutcrackers are so easy, I don't even need a step by step to explain them. 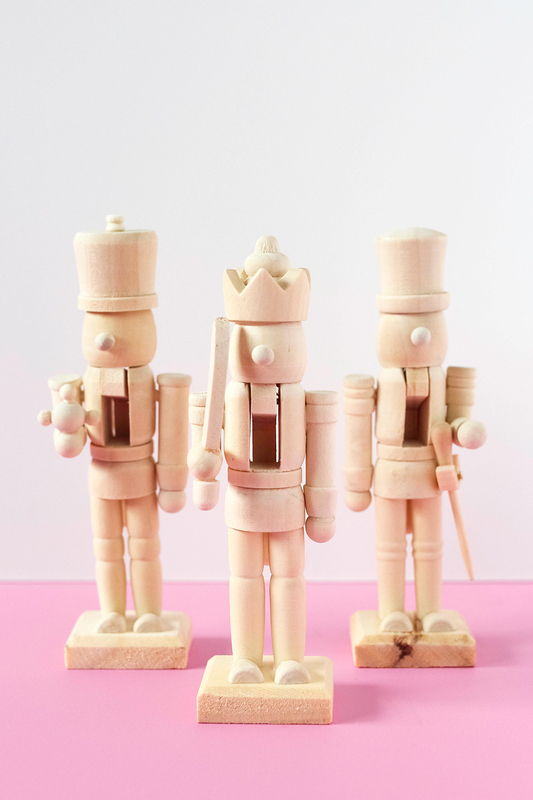 All you have to do is paint one nutcracker at a time - so simple! I just grabbed some paint, put on my favorite TV Show, and they were honestly done in no time. The colors went on so nicely and they turned out so vibrant in the end. And if you're looking for a craft to get your whole family in on, this one's definitely one to consider. Just pass out the nutcrackers and paint! Don't forget to tag me and use #crafterward on Instagram to share your creations with me! Wishing you all the happiest holidays, friends! These are absolutely adorable. I have 3 sister who are a bit older than me...and they enjoy decorating for the holidays (in fact one collects nutcrackers) Is This will make great gifts for the and a few others.Thanks.